Home > After The Birth > What If Your Baby Has to Stay in Hospital? If your baby needs to spend time staying in hospital it can be a really worrying time for parents. Your usual routines and schedules will be torn apart and you may need to be temporarily separated from your bundle of joy. When you're used to having your child at home and part of the family, even the shortest separation can be a real wrench - both for you and your baby. If this situation may arise for you, here are some tips on preparing and dealing with it. Keeping things as relaxed and normal as possible is one of the key elements of successfully coping when your baby needs to stay in hospital. It's a strange and unreal experience - both for parents baby - but as babies easily pick up on any stress or anxiety, it's important that you remain as calm and composed as possible. Depending on the age of your baby and the circumstances surrounding their hospital stay, it may help to prepare them in advance for what's to come. Talk to them about the fact that they're going into hospital, what it will be like, where they'll sleep and who'll be there with them. There are lots of children's fiction and non-fiction books available dealing with children who are in hospital, so reading stories can help them identify with characters and gauge a bit of an idea of what's involved. Another useful tip for acclimatising toddlers is to engage in make-believe play with teddies or other stuffed animals. Encourage them to act out hospital scenes and scenarios. Avoid telling young children that everything will be fine and nothing will hurt if there's the chance that their illness means that they'll be having procedures that will be a bit uncomfortable. They won't appreciate little white lies and it's better for them to be able to try and understand what and why things are happening. Many children's wards run pre-admission sessions so families can go along and see the surroundings and are given information about the format of the stay. Depending on why your baby will be in hospital and how serious their illness or condition is, there may be facilities for parents to stay with their baby. Some hospitals, for example, may have a room for parents or at least a put-up bed that can be used if you need to stay the night. It's important that you're happy with what's going on, so be sure to ask any pressing questions. Despite any preparation, the actual situation of being in hospital may well be upsetting for your baby. Try and keep up with your usual activities, such as playing or reading, as much as is viably possible. Days spent in hospital can seem long and dragged out, so any time when you're doing something more enjoyable will help. If your child is able to be moved around, or perhaps when they're recovering, make use of the hospital day room or children's play room for a chance of scene. Also ask whether they can be taken outside, as a breath of fresh air can sometimes be beneficial. Remember to keep any games, stories or play as quiet as possible if there are other patients around; they'll need peace and quiet too and you don't want to cause any unnecessary disturbances. Other parents going through a similar situation can be supportive, but also bear in mind that they may prefer privacy and might not want to socialise with you. 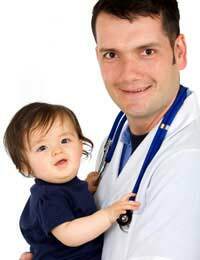 Hospitals, nurses and doctors will have your baby's best interests at heart, so be guided by them. Most hospital stays are for a limited time and, although it can be an emotional time for all involved, you'll get through it.